Heard a new AM station last night, WSAR transmitting 5 kW on 1480 kHz located 91 miles east of here in Fall River, Massachusetts. The signal varied between S-0 and S-5 while listening to the Red Sox pre-game show. 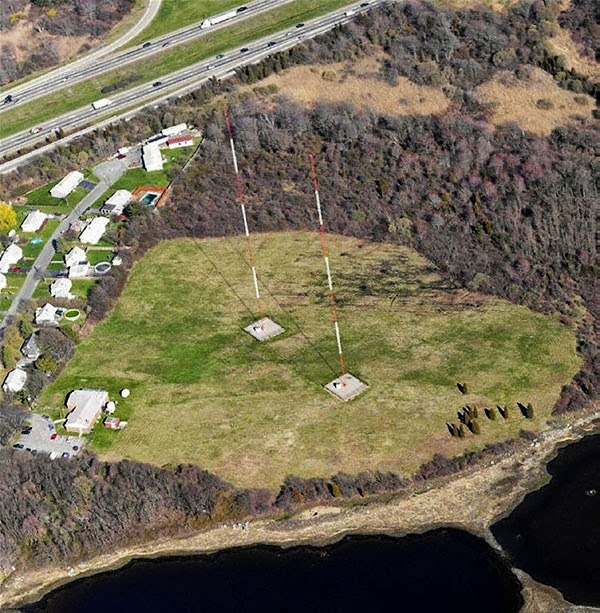 WSAR's transmitters are located between I-195 and Lee Cove on Mount Hope Bay, as shown in the accompanying photo (Source: Bing Maps). WSAR is station number 163 in my AM log. Equipment used were a C. Crane CCRadio-SW receiver and C. Crane CC Twin Coil Ferrite antenna.